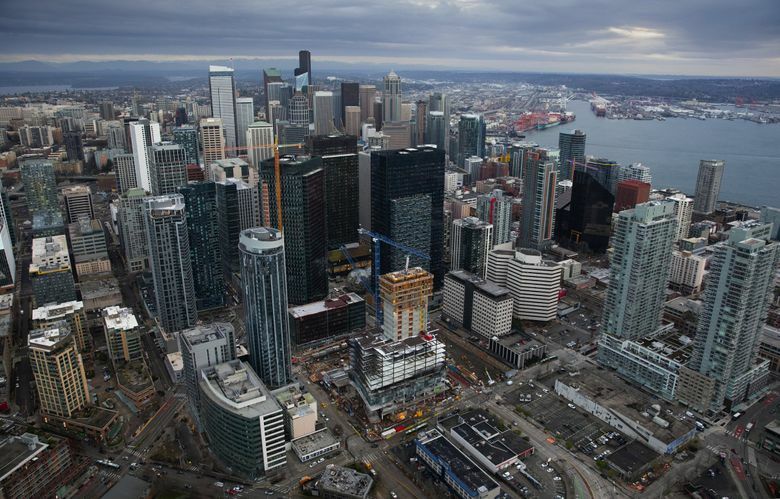 The “back to the city” phenomenon continues to be good to Seattle, as the latest State of Downtown report shows. The trend of center-city revival has played out across the country, especially over the past decade, as many millennials and empty-nest baby boomers moved into central cores. Companies followed, seeking to attract top talent that prefers the energy and authenticity of the best downtowns. It is the most profound urban shift since suburbanization took hold in the 1950s. Seattle, with repeated public-private efforts to keep downtown strong, is one of the nation’s best examples. And the transformation since the recession has been especially dramatic. “If you haven’t been to Seattle in the past decade, it’s almost as if you haven’t ever been to Seattle,” Jon Scholes, president of the Downtown Seattle Association, told me. The number of downtown residents rose 38 percent between 2010 and last year, according to the report. That meant a total of 82,000 people, including 4,400 children. The number of youngsters is up 89 percent. Jobs rose 39 percent to 300,000, with average pay 18 percent higher than jobs citywide. Downtown is the biggest employment center of the region, with 71 million square feet of office space. Some 13 million square feet were added since 2010. The latter number is the equivalent of building nearly nine more Columbia Centers, the tallest building in Seattle. Another 4.5 million square feet is scheduled for completion this year. Brick-and-mortar retail sales totaled $1.6 billion last year, up 38 percent since 2010. Tourism and visitors continue to be a big business, too, highlighted by 15 million annual visitors to Pike Place Market and 1.1 million passengers boarding cruise ships. About 400,000 attended conventions this past year — a number expected to rise with the expansion of the Washington State Convention Center. The downtown report said 125 new restaurants opened downtown last year. Another benefit for Seattle has been continued increase in transit use. Federal figures from 2017 showed metro Seattle led the nation in growth in transit ridership, adding 4.7 million trips to reach an all-time high of 191.7 million. The association’s report said 75 percent of downtown workers regularly used a transportation mode other than driving alone. About 37 percent walked to work. The association defines downtown as 12 neighborhoods, running from South Lake Union through Belltown, the retail core, Pioneer Square and Sodo. Although the latest report was released to members this past week, the data are available here. On the other hand, “we’ve got to get after challenges,” such as housing affordability, a more coordinated and accountable approach to addressing homelessness, and preparing for the need for additional space for a rapidly filling downtown. The fragility of streetfront retailing — most downtowns have lost theirs — is another concern given e-commerce and changing shopping tastes. A major remodeling of Pacific Place will include an expansive new north-side entry. The biggest challenges will need to be addressed with public-private partnerships, something Seattle has lost in recent years. “We have to renew that,” Scholes said. “In the 21st century, the cities in the best position will use that model. It will be especially important with the federal government stepping back” from helping cities. My footnote: It will be interesting to see how the Amazon moves in New York City and northern Virginia will affect downtown Seattle, which has benefited so much from the giant’s growth. I suspect not much. Seattle continues to be attractive to Bay Area tech giants, and Amazon’s not going anywhere. Still, Amazon’s future should be a concern. A strong downtown is an asset for the entire region, as I’ve written repeatedly. One need continues to be increasing transit connections to outlying areas, and within the core, especially the First Avenue segment to complete the Center City Connector streetcar. A vibrant core is also preferable to sprawling office “parks” dependent on emission-belching automobiles. Having lived in or near downtowns in San Diego, Phoenix, Denver, Cincinnati and Charlotte — at different stages of their revival and seeing how they turned out — I see Seattle sitting well above most of its peers. But downtowns are never done. And the insularity and left-wing blinders of Seattle’s political class these days — so different from the leaders that prepared the core’s continued reinvention — always worries me.